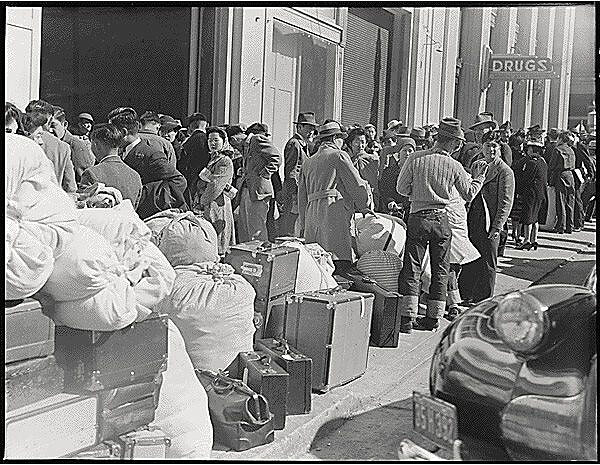 Japanese internment begins with forced evacuation from San Francisco on April 7, 1942. 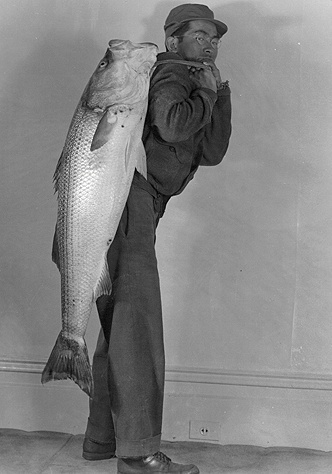 Dorothea Lange, well-known documentary photographer of the Depression, is on wall in background with large format camera. Japanese-Americans waiting on Van Ness to be transported to internment camps, 1942. 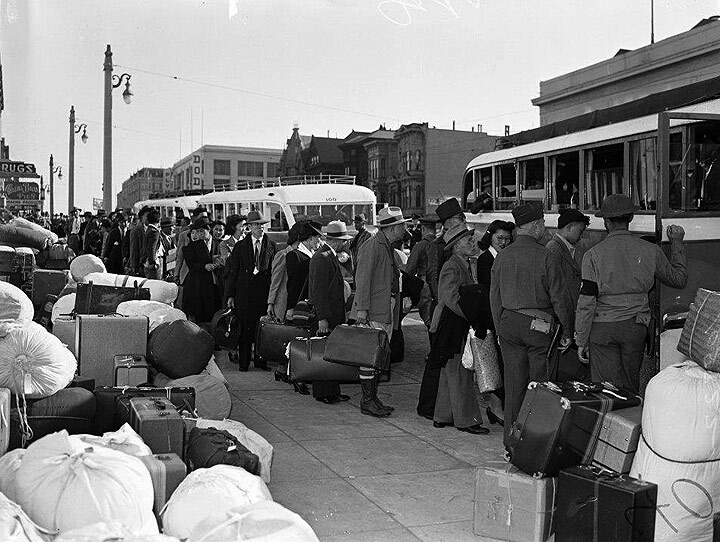 East Bay Yesterday podcast on the fraudulent justifications for Japanese internment. Japanese being taken away for internment, April 6, 1942. In the late 1800s, most Japanese lived on Rincon Hill, near South Park in the South of Market area. After the 1906 earthquake, the Japanese community moved out to the Western Addition near the intersection of Post and Laguna streets. There they established Nihonmachi or Japanese town, now known as Japantown. Japanese Americans were considered spies and a threat to the war effort against Japan. Ironically, many Japanese Americans served as spies on the American side of the war and others left the camps to lose their lives on the battle field under the American flag. Notably, Japanese Americans living in Hawaii were not interned, despite their greater numbers and the national security threat to that area following the Pearl Harbor bombing. Some theories assert that Japanese Americans were ordered removed from the coast of California not because they posed any national security threat, but because efficient Japanese farmers had taken over the agricultural industry from white farmers in states like California and Washington. The government feared an increase in Japanese American economic power since the agricultural industry would gain strength in a war time economy. Whatever the reason for the U.S. removal of Japanese Americans from their homes, the imprisonment of so many U.S. citizens and residents was devastating to the Japanese community. Families lost their homes, businesses, and worldly belongings. They were incarcerated by a government that they considered their own and were thrown into horse stables unfit for human habitation. The Japanese community proved resilient, however. Despite the atrocities committed against them during World War II, Japanese Americans returned to their homes after their incarceration in the camps and began the process of restoration. 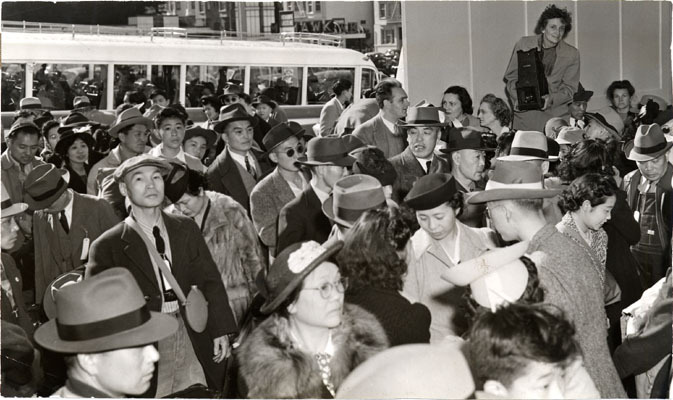 In San Francisco, although many Japanese Americans returned to their homes in Nihonmachi, some chose to move to the Richmond District. A decade or so later, those in Nihonmachi were forced to move again. At this time, Geary Boulevard was widened to provide middle-class residents of the Sunset and Richmond districts a major thoroughfare into downtown. This widening also effectively divided Japantown from Western Addition and the Fillmore, separating Japanese American and African American communities from each other. Also at this time, the land for Japan Center was sold to Kintetsu Corporation to build as a neighborhood shopping center. The corporation razed the existing Japantown/Koreatown along Post Street and built a more corporate and tourist-oriented complex, displacing many small business owners and residents who could no longer afford to live or do business there. The northern boundary of Western Addition and Japantown has always been defined by the segregation practiced by the San Francisco real estate industry, which effectively barred minorities from moving in north of California Street. Although this practice legally ended in the 1960s with the enactment of fair housing laws, even today few people of color live north of this historic racial divide. 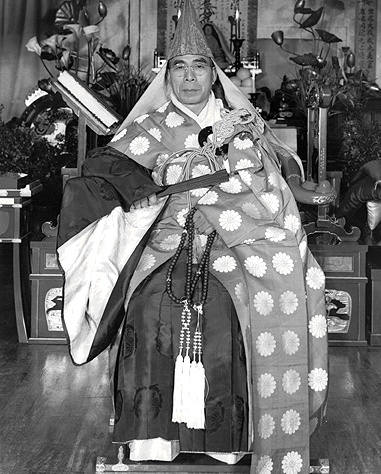 Unattributed photos on this page were discovered in a dumpster in Japantown in 1995.